Robert D Yates was born in Brooklyn, New York in 1857. His checkers playing career, while tragically short, was spectacular. 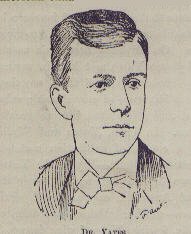 In 1873 at age 15 he met the World champion James Wyllie who was beginning his first tour of America, and impressed the "Herd Laddie" sufficiently that a 50 game match for the World title was arranged when Wyllie again passed through New York 3 years later in 1876 on the return leg of his tour. Everything hinged on the last game, the score being 1 win each and 47 draws after the 49th game was concluded. It is one of the most famous games in the history of draughts. Yates got into trouble, Wyllie missed a forced win, then Yates turned the tables and won the game, thereby winning the match by the score of 2 wins to 1, and so becoming World Champion at the age of 18. The following year 1877 he successfully defended the title in a 50 game match with Robert Martins, and also defeated American champion WR Barker in a short match of 10 games. Although there were negotiations for a return match with Wyllie, Yates relinquished the title in 1878 in order to pursue his studies in medicine, which he duely did, qualifying as a physician in 1883. After two years working at the Flatbush Hospital in New York he accepted a post as ship's physician on the steamship Scheidam, but on his first voyage in 1885 he died of typhus fever, probably contracted while he was working at the hospital. He was buried at sea.